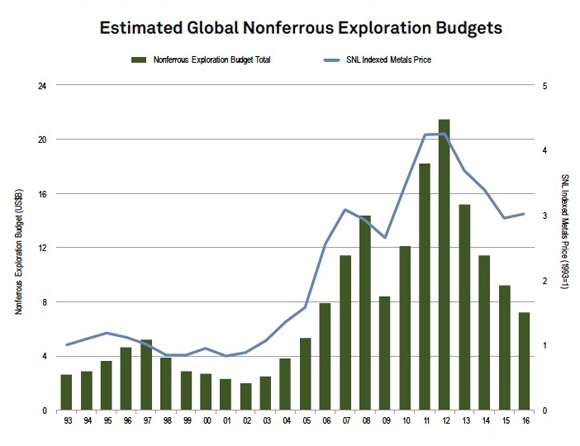 How would National Geological Surveys respond to year lows of declines, deep downturns and spending drops in mineral exploration? 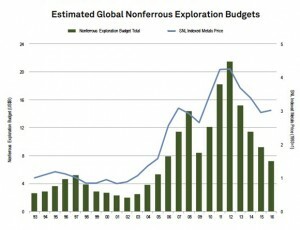 – major miners spend a limited amount of their production earnings to in-mine and/or near-mine brownfield exploration. – A strong greenfield exploration program is central to the long-term growth of the industry, as this is the only way of delivering the next major new mining camp. It is the best solution is to find new, high-quality deposits. -Genuine greenfield discovery focused on high-quality targets remains the best long-term option to grow a company. -Exploration success is not measured simply in terms of the number of deposits found, but rather the number of high-quality mines built. In such times, National Geological Surveys should ensure a strategy for long-term sustainable greenfield exploration in order to secure future mineral resources supplies uninterruptible.